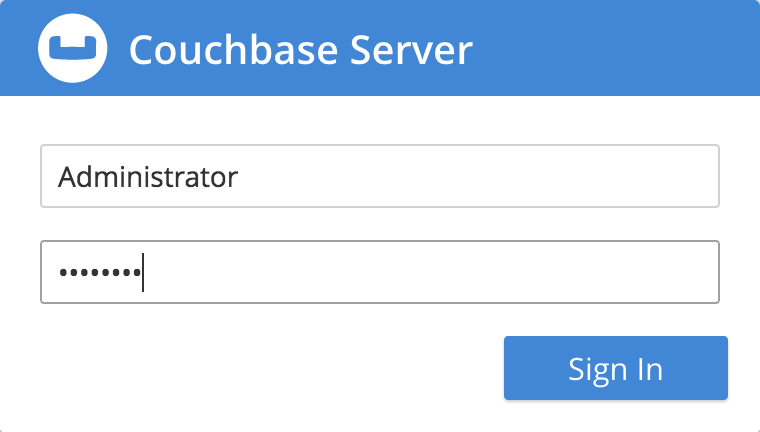 Once you have Couchbase Server running, you can log into the Couchbase Server Web Console, and start to examine the different features that it provides. These features include an interface for inspecting Couchbase documents, organized within buckets. Type these credentials into the appropriate fields and click Sign In. The Cluster Dashboard provides a graphical summary of the current state of your Couchbase cluster. The term cluster might seem unexpected at this point, since you are only running a single instance of Couchbase Server; but nevertheless, it counts as a cluster of one. All of the values that are displayed on this screen were automatically configured by the sandbox container image during installation. In production, you will specify these values individually according to your needs. Notice the Buckets panel, towards the bottom. This shows that you have a single active bucket on the system — bucket meaning a logical group of data-items. 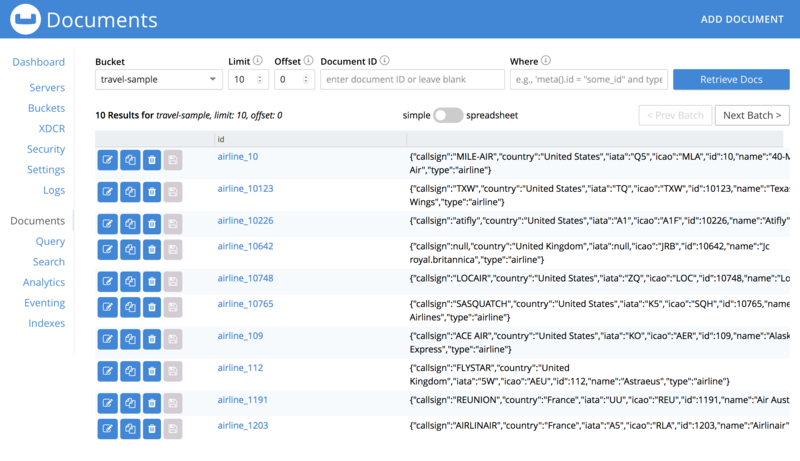 Taking a closer look at this bucket will give you some idea of how Couchbase stores data, and prepare you to make your first data-queries. Click Buckets in the left-hand navigation bar to bring up the Buckets screen. The name of the single bucket (travel-sample) appears towards the left of the single row. Additional information is provided in columns, across the row. Click Documents, which is located towards the right of the travel-sample row, to go to the Documents screen. Bucket: A drop-down menu that displays the name of the bucket whose documents are currently being viewed. You can use the drop-down menu to select other available buckets. Limit: The maximum number of rows (documents) to retrieve and display at once. Offset: The number of documents in the entire set of the current bucket that should be skipped, before display begins. Notice that when you click Next Batch >, the Offset increases by the same value that is specified in Limit. Document ID: Accepts the ID of a specific document. Leave this field blank to retrieve documents based on Limit and Offset. In the results, each document is represented by an individual row that contains its ID and a summary of its contents. You can switch between two views: simple and spreadsheet. In the spreadsheet view, you can edit the document fields directly, since each key has its own column in which the corresponding value for each document is provided, row by row. The document consists of a series of key-value pairs (or, as they are sometimes expressed, name-value pairs). You can make modifications to key-values directly in this editor. As will be demonstrated later, Couchbase Server allows you to search for keys, and return the corresponding values, by means of a query. For example, here, if you searched on the name country, you would return the value United States; if on the name icao, the value MLA. If you make changes in the Edit Document dialog, click Save to save your changes. 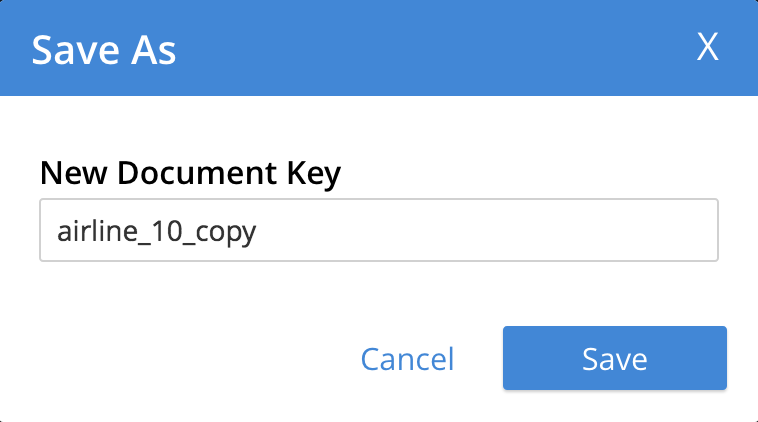 If you want to create a new document based on an existing document, you can click the Make a copy of this document button (described next). If you want to create an entirely new document, you can click the ADD DOCUMENT button in the upper-right. Either click the Save button to save the copy under the placeholder name that is provided, or edit the placeholder-name before saving. Note that if you are using the spreadsheet view, any unsaved changes that you have made to document key-values will be saved in the copied document and not the original, much like the behavior of traditional text editing software. Delete this document: Click this button to delete the document. Save changes to document: If you make changes in the spreadsheet view, this button becomes active for the current row. Click it to save your changes to the document. To view successive sets of documents, use the Next Batch > and < Prev Batch buttons. 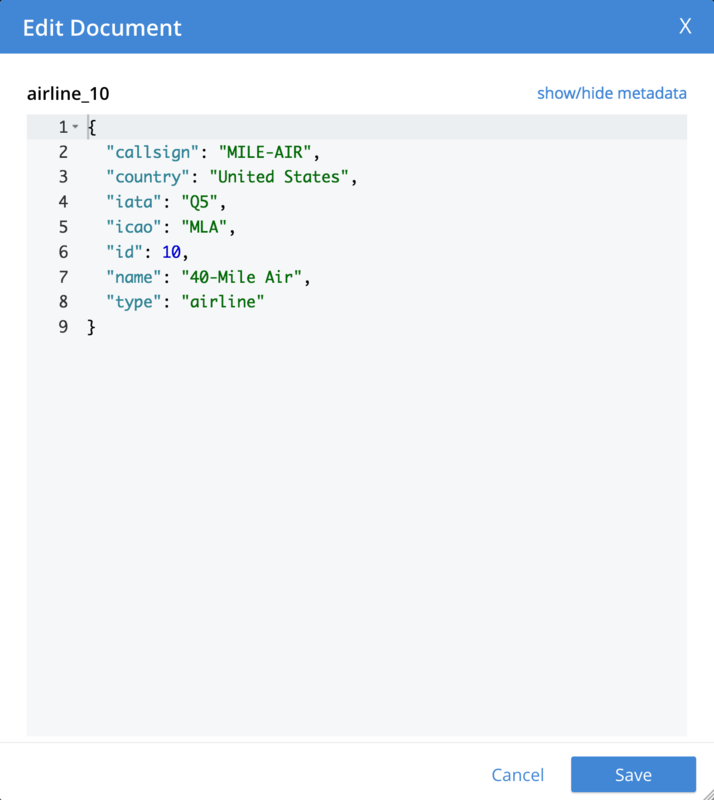 Now that you have a basic familiarity with the way in which Couchbase Server organizes data, you can start to define and execute queries to return specific data subsets. You’ll experiment with this in the next section: Run Your First N1QL Query. Manage Buckets: Contains basic information about buckets. Data Model: Provides more information about the Couchbase data-model.